If you have ever been to San Francisco, then some part of you—or some former part of you—has almost certainly passed through the city's Southeast Wastewater Treatment Plant. But, considering how utterly vital it is to the city, the wastewater plant is also very much invisible, tucked away in a neighborhood no tourist would have heard of. Bright and early one recent Saturday morning, Gizmodo went to see what San Francisco's sewage plant is really like. The Southeast Wastewater Treatment Plant is the oldest and largest of the city's three, handling 80% of all water that passes through the city's sewers. (Another, much smaller wastewater treatment plant is located near the zoo and a third only comes online during the rainy, winter season.) In all, San Francisco's sewers include over 1,000 miles of pipe—enough to reach from San Diego to Portland. On an average day, it treats 80 million gallons of wastewater. However, because the city has one of the unusual combined sewers that transports sewage and stormwater in one set of pipes, that number rises to the incredible 575 million on a rainy day. The Southeast Wastewater Treatment Plant on Google Maps. But enough with the numbers—how did it smell? Not entirely unpleasant, pleasant here and there, sometimes nauseating, all depending on where you were in the process. To find out how raw sewage gets turned into clear water that seagulls will gladly swim in, let's hold our noses and embark. Our tour guide was Jonathan Smith, a materials testing aid for the SF Public Utilities Commission (PUC) with a Tennessee twang. In the first step, bar screens remove the big pieces of debris, including tampons, wrappers, and many pieces of leaves. It doesn't smell great here, but I've been to public bathrooms that are worse. Finer screens remove grit. All of this debris and grit is moved by the truckload into landfill. This wastewater treatment plant was built in the 1952, and it definitely shows in the control room. At the primary clarifiers, sludge gets a chance to settle and scum is skimmed off the top. After this point, the sludge gets taken off to a sludge blend tank. We'll follow the liquids and come back to the sludge later. Like a dose of sewage probiotics, oxygen-loving bacteria and oxygen is pumped into the aeration basins where they can start breaking down any remaining solids. When an odorous breeze came off of the basins, I was beginning to regret how I decided to spend my Saturday morning. Jonathan warned us not to fall in. "If you do, you'd probably have the biggest staph infection ever." Closed aeration basins (above) and an open one. Once the bacteria have done their job, the water is remarkably cleaner. By the secondary clarifiers, seagulls are splashing about in the water. Chlorine is added for disinfection and then neutralized by sodium bisulfite before it's released into the Bay. The chemical smell reminds me of laundry, with a vague undernote of dank. But, man, back to the solids. There is where I actually felt nauseated. 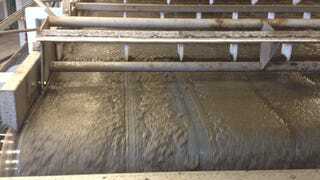 Polymers are added to the sludge to thicken it up on these belts. In these 16 pancake digesters, the solids get heated up to 95 degrees Celsius. This time, bacteria that live without oxygen do their work, breaking down the remaining sludge over 15 to 30 days. In that process, they give off methane, which is used to generate 50 percent of the plant's power. The remaining stuff is spun down in "biosolids," which are used to fertilize landfill cover and non-food crops. The plant makes 200 tons of it a day. Think about how much poop that must be everyday. At the end of the tour, it occurred to me that San Francisco's aging wastewater plant at night would be would a terrifically creepy setting for a horror movie. The creaking metal machinery, the dim sodium-vapor lights, the peeled signs, and most of all, those pools of raw sewage. How fitting that the greatest danger would be drowning in our own waste. That's actually not a terribly implausible scenario. So much of the city's sewer system is more than a century old that we're one bad earthquake away from systematic failure. "It is not a matter of if, but when the next earthquake will it the Bay Area," says the PUC's own literature. The city's century-old pipes have also have an occasional habit of giving out, leaving the street to cave in. Because San Francisco has one of the rare combined sewage systems where stormwater runoff and sewage all end up in the same plant, it also has to worry about how rising sea levels could back up the system and thus back up sewage. A 20-year, $6.9 billion Sewer System Improvement Program to make badly needed upgrades is in the works. A sign at the wastewater treatment plant. It's only when the invisible infrastructure breaks that we remember how disgusting our piled up waste really is. Living in a functional, modern city means what we so rarely have to confront that waste. Trash is picked up. Sewage is flushed down the toilet. For the people living next to a wastewater treatment plant, though, it's harder to forget. The Southeast Wastewater Treatment Plant is located in Bayview-Hunter's Point, one of the city's poorest and most marginalized neighborhoods. Houses sit just across the street from the plant itself. As you can imagine, proximity to the city's sewage does not do wonders for real estate. In fact, Bayview-Hunter's Point has long been where the city's unsavory infrastructure ended up. The neighborhood holds just five percent of San Francisco's population but a third of its industry and toxic sites. That's thanks in large part to a former Navy shipyard turned Superfund site and a major coal power plant that operated until 2006. A few years ago, an environmental group put together a "toxic tour" of the neighborhood. Industrial landscapes like the oil fields of Pennsylvania or Chernobyl or northern New Jersey can be called "sacrificial landscapes," ravaged so that the rest of us can live with our electricity and clean water and consumer goods. Modern life in the city can only be so comfortable because the resources and infrastructure that make it that way are conveniently hidden. But all our sewage has to end up somewhere. Thanks to Intersection for the Arts for organizing this tour. You can arrange your own tours of SF's wastewater treatment plants with the Public Utilities Commission.